Model was identical mechanically to the US Divers Stream Air DW. 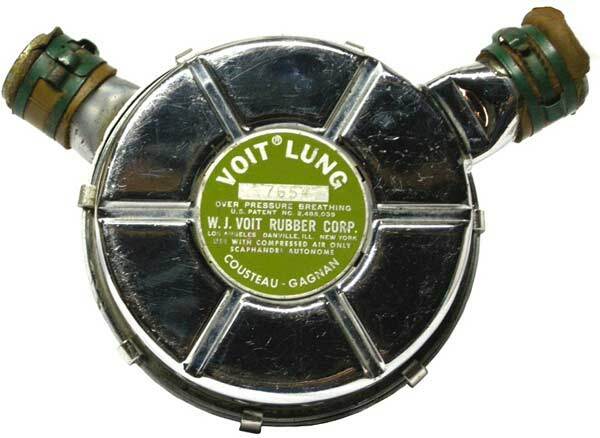 It was typically produced with green hoses, Tinnerman hose clamps, straight mouthpiece, and label. Top box assembly (contains valve mechanism) finished with satin chrome. Bottom box assembly (contains exhaust valve) finished with shiny chrome. Box clips were used to connect the top and bottom boxes. 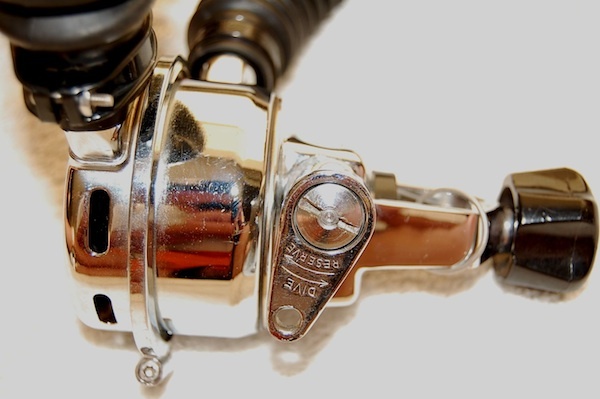 Late production models were frequently found with grey hoses, “hourglass” mouthpiece, chromed Tinnerman hose clamps, and a blue label. Two verified examples had satin chrome on both the top and bottom boxes. 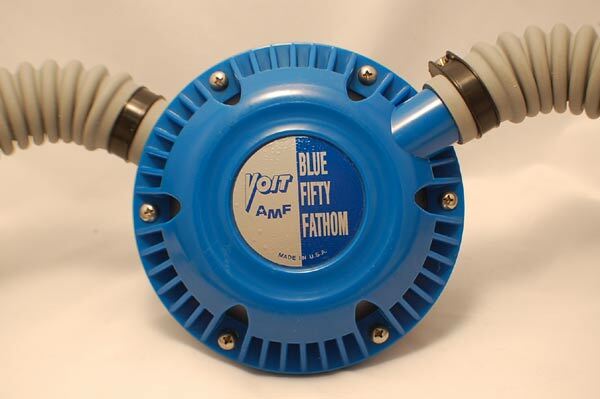 It is likely that all of the “blue labeled” regulators had this unusual finish. These late production VR1 models had the “Mistral” venturi tube installed, and a single indexing hole in the top box assembly. 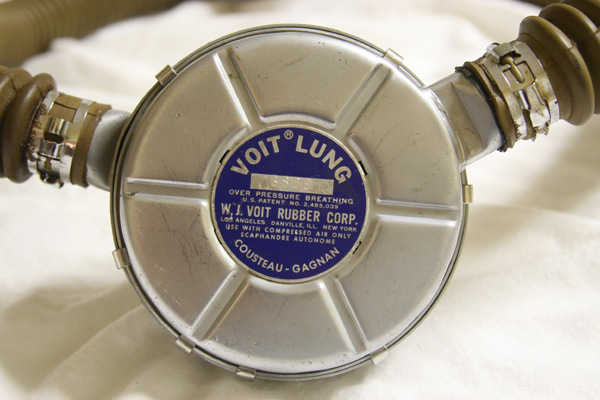 The venturi tube was set to point straight down through the inhalation tube, unlike the earlier generation models. 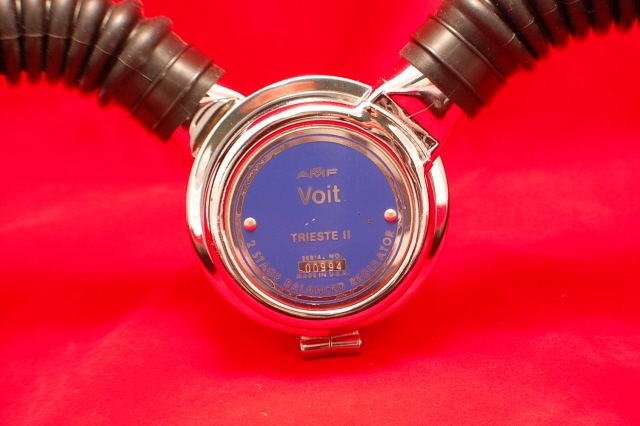 In essence, the “blue labeled” VR1 regulator was mechanically identical to the US Divers Mistral DW model. Model was identical mechanically to a US Divers Navy Type DA. It was produced with green hoses, Tinnerman hose clamps, straight mouthpiece, and label. Top box assembly (contains valve mechanism) finished with satin chrome. Bottom box assembly (contains exhaust valve) finished with shiny chrome. Box clips were used to connect the top and bottom boxes. One source lists a late production version with a blue label, but the researcher has not been able to substantiate this claim. Model contained the Gagnan downstream valve mechanism. US Divers did not produce a comparable model. 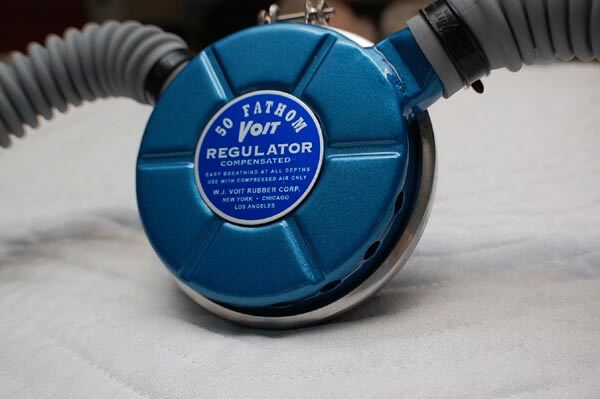 Regulator boxes were painted with blue, metal flake enamel during 1959 and 1960. The blue painted versions featured grey hoses, “hourglass” mouthpiece, and chromed Tinnerman hose clamps. 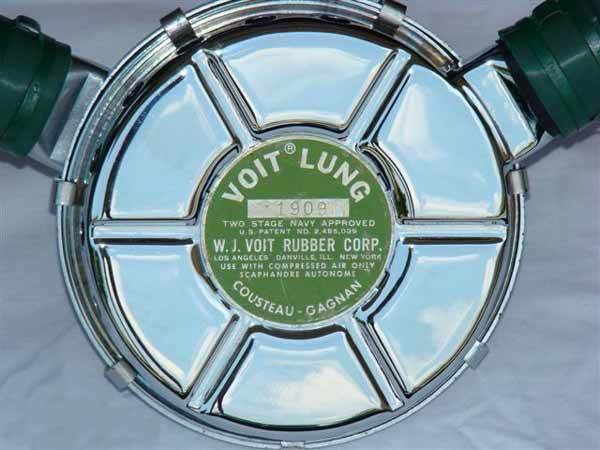 1961 produced versions were chrome plated, and used nylon hose clamps. Top box assembly (contains valve mechanism) finished with satin chrome. Bottom box assembly (contains exhaust valve) finished with shiny chrome. A clamp ring assembly was used to connect the top and bottom boxes. Model was identical mechanically to the 1961 chrome plated version of the VCR-2, with the exception of the boxes being produced from ABS cycolac plastic. 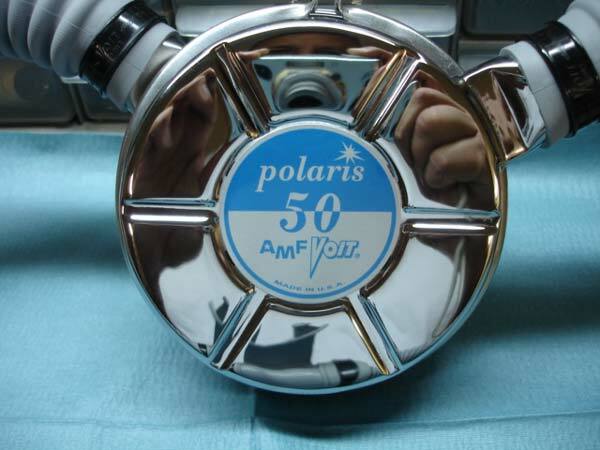 V22 Polaris 50: (cataloged 1962 and 1963) Model was similar mechanically to the US Divers Mistral DW. The lever plate and venturi nozzle were of a different configuration. Horizontal movement of the lever plate adjusted lever height. It was produced with grey hoses, “hourglass” mouthpiece, and nylon hose clamps. Top box assembly (contains valve mechanism) finished with satin chrome. Bottom box assembly (contains exhaust valve) finished with shiny chrome. A clamp ring assembly was used to connect the top and bottom boxes. 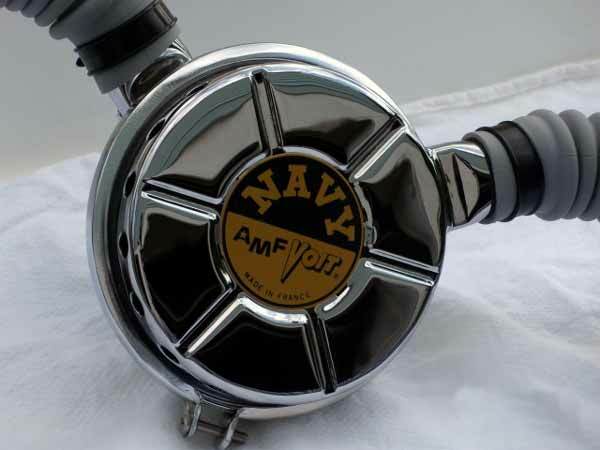 V66 Navy: (cataloged 1962-1964) Model was identical mechanically to a US Divers DA Aqua-Master. It was produced with grey hoses, “hourglass” mouthpiece, and nylon hose clamps. Examples exist that have both box assemblies finished in shiny chrome, and some in the traditional satin/shiny combination. A clamp ring assembly was used to connect the top and bottom boxes on some examples, with box clips also encountered. The box clips version appears to be the most common. According to one Voit service manual, the earliest versions used the ring clamp system. This is most likely correct, as only the 1962 catalog illustrates a ring clamp as a standard feature. Two different color combinations on the identification plates were used on the V66. Regulators produced in France have black and gold labels, and the ones produced in the USA have blue and gold. R22 and R22J Trieste (cataloged 1966-1970) Model contained a two stage, balanced mechanism. US Divers did not produce a comparable model. The R22J version contained an integral 300psi reserve unit. This could be added to the R22 version later (if so desired). Early production examples had only a HP auxiliary port, while later versions had both one LP and HP port. The Trieste was fitted with black hoses, “hourglass” mouthpiece (different lettering than grey version), and nylon hose clamps. Voit produced a version known as the Trieste II. It was mechanically identical to the Swimaster version. It came with a blue label, and curved mouthpiece. All versions had both box assemblies finished in shiny chrome. A clamp ring assembly was used to connect the top and bottom boxes.